On Wednesday 29 February, an evening of theatre, readings, photographs and music in memory of Václav Havel, former Czechoslovak and Czech president, author, playwright, human rights campaigner and a prisoner of conscience who passed away on December 18, 2011, was hosted by the Ambassador of the Czech Republic and Sir Tom Stoppard at the Royal Institute of British Architects. 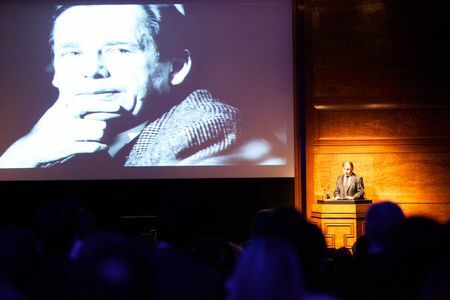 The evening featured readings from Havel´s works by Jeremy Irons, songs by Czech musician Vladimir Merta, excerpts from Havel’s plays performed by the actors of the Orange Tree Theatre from Richmond, personal testimonials by Ambassador Michael Žantovský and Sir Tom Stoppard, excerpts from documentary films Václav Havel, Prague-Castle by director Petr Jančárek, and Citizen Havel by Pavel Koutecký and Miroslav Janek, and a slideshow of unique photographs of Václav Havel by leading Czech photographers. 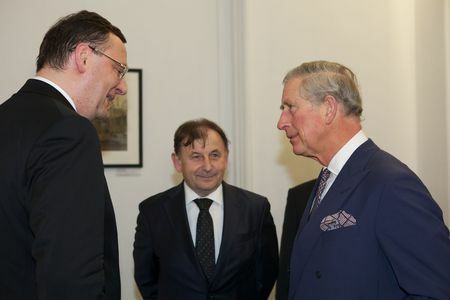 Among the distinguished guests of the evening were HRH The Prince of Wales and Mr. Petr Nečas, Prime Minister of the Czech Republic, members of both houses of the British Parliament, representatives of the Czech and British governments, ambassadors and high commissioners, representatives of Czech organizations in the UK and members of the public.